Waterman Roller Gates are ideally suited for controlling water in any large openings such as may be found in power plants, water and sewage treatment facilities, flood control projects, irrigation systems, and on top of dams to increase reservoir capacity. 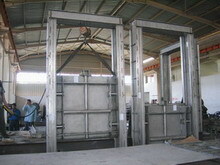 Waterman Roller Gates are available in either overflow or breast wall type. They are manufactured to be downward or upward opening. They may be engineered to take pressure from one or both sides of the gate.